Explanation: Grand tidal streams of stars seem to surround galaxy NGC 5907. 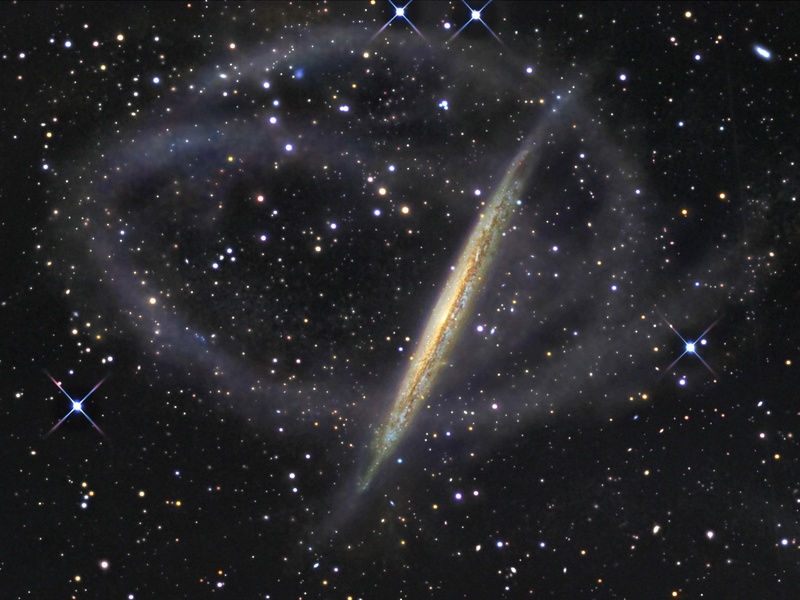 The arcing structures form tenuous loops extending more than 150,000 light-years from the narrow, edge-on spiral, also known as the Splinter or Knife Edge Galaxy. Recorded only in very deep exposures, the streams likely represent the ghostly trail of a dwarf galaxy -- debris left along the orbit of a smaller satellite galaxy that was gradually torn apart and merged with NGC 5907 over four billion years ago. Ultimately this remarkable discovery image, from a small robotic observatory in New Mexico, supports the cosmological scenario in which large spiral galaxies, including our own Milky Way, were formed by the accretion of smaller ones. NGC 5907 lies about 40 million light-years distant in the northern constellation Draco.